Primarily focusing on code-breaking, symbolism and association problems The Sherlock Escape Room will offer an interesting challenge for new and returning players alike. Having been enlisted by Moriarty, your task is to break into 221B Baker Street, defeat Sherlock's failsafes and retrieve Sherlock's prized possessions. Hurry though, Sherlock and Dr Watson are hot on your tail! Your friend has been missing for days, believed to have been taken by a mysterious serial killer. The police have yet to come close to capturing the kidnapper. You have been working hard to find your friend, and have tracked them down to an office in an engineering facility. Is this just a normal office, or have you stumbled across the secret lair of serial killer? Welcome to the school of witchcraft and wizardry where there has been some funny goings on. In a classroom full of tricks, puzzles, challenges and spells, you must solve them all to escape the grasps of the evil professor and graduate with a distinction! 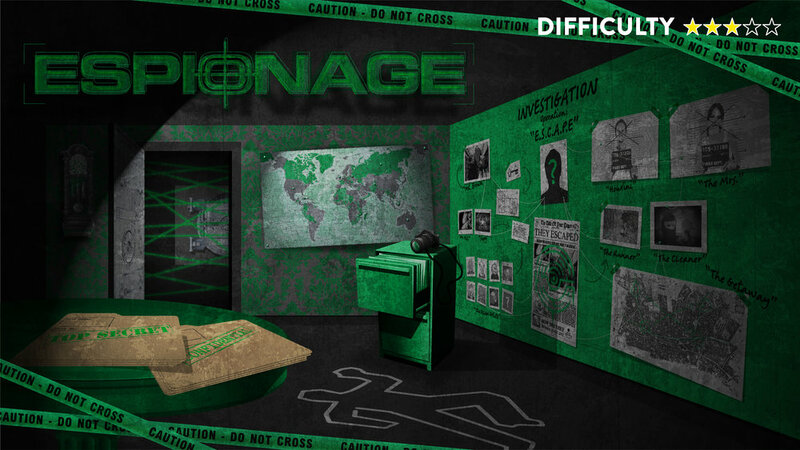 Assemble your team of crack thieves, negotiate the security systems in the bank and escape with as much money from the vault as you can before the cops show up. You have 60 minutes and counting! Available for 2-12 players, split into two teams to play head to head in our identical rooms. The world has been infected with a virus. You have two options; sit around and let it take you or redouble your efforts to retrieve a vaccine from an old medical facility. In order to get your hands on it, you must find a way to defeat the lock down on the lab. Your friend is a journalist who has a keen eye for conspiracy theories. He had recently been focusing on government related theories, that was until he went missing! The last contact you had with the journalist was about an important hard drive he has hidden away in his office explaining every conspiracy he has solved. You must retrieve the hard drive before the FBI can get their hands on it! A plague has spread across the nation and your friend is locked in the mortuary. However rumour has spread that the disease is not in fact fatal and many have been buried alive. Your friend has been diagnosed with the plague and has been left to die in the mortuary. Free them from their coffin and escape before you all end up buried alive! Please Note: Expect shocks and surprises throughout the escape experience. Unfortunately the Vaults are not accessible for those with mobility issues. The country is in turmoil and a civil war is raging across the land. Charles I has escaped captivity and is on the run from Oliver Cromwell's forces. It is believed Charles has confided in the Orme family as to where he has fled, so you must ransack their residence to find clues and the important information that will lead the Roundheads to Charles' location. You only have 60 minutes before the Orme family return! Unfortunately the Vaults are not accessible for those with mobility issues. It’s 1840 and you are a guest at one of Thomas Cooke’s famous banquets. As usual the wine is flowing, and Thomas is bragging about the rare treasures him and his family have acquired from around the globe. Except tonight he accidentally let slip the location of where they keep those treasures. You have spiked his drink with a sedative, which knocks him out cold for 60 minutes! Enter the Wine Cellar, crack the puzzles to gain access to and steal the treasures before he wakes!